Jamaican celebrations have their own special vibes and flavour. This page will give you a taste of three seasons of festivity in a country which excels at being festive. Christmas is a great time to be in Jamaica. As in other western societies, there is a bustling mixture of religious and secular activities. Houses are decorated and many people put up Christmas trees. Those who don't will sometimes indulge by stringing a few pepper lights somewhere in their yards. 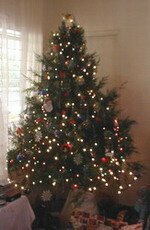 In many communities there is a Tree Lighting Ceremony in which a Christmas tree erected in a central place is officially lit. Businesses and civic organisations host treats for children, the elderly and the needy. All through December there are parties, dances and street jams, which in most major towns culminate on Christmas Eve. On this night, called 'Grand Market' night, Jamaicans of all ages gather in the town centres to socialise, eat, drink, dance and have fun. Children are allowed more freedom on Grand Market night, staying out late, roaming the streets, and often being treated to toys of their choice. Music is everywhere. Street vendors selling food, toys and gifts set up their stalls in every available space from early in the day. The party goes on until morning, punctuated by the sound of firecrackers, despite them being strictly illegal. On Christmas Day, families gather together, and many Jamaicans go to church - even some who've been partying all night! Traditional western carols (e.g. Joy to the World, O Come All Ye Faithful) are popular, as well Caribbean Christmas songs (Sing de Chorus Clap you Han). Christmas dinner may include ham, roast chicken and rice and peas. Gifts are exchanged, and although Santa Claus may visit a few children, he is not widely believed in. Christmas cake or pudding, a heavy fruit cake made with raisins, prunes and other fruit which have been steeped for weeks in wine or rum, is a favourite in the Christmas season - a remnant our British heritage. Another staple at Christmas is sorrel, a delicious deep red drink made from the sepals of the sorrel plant. Click here for a Christmas cake recipe. The day after Christmas, Boxing Day, is a public holiday, and the merrymaking continues. 'Open House' is a popular feature, in which friends, and friends of friends, are welcomed into someome's home to visit, eat and drink in an informal setting. Work resumes on December 27, but in my experience not much gets done before the New Year - too much holidays on the brain! The festivities are rounded off with New Year's Eve parties, and a second round of Open House on New Year's Day. Then comes January, and everyone is broke, or exhausted after the greatest of Jamaican celebrations. As Jamaican celebrations go, Easter is by no means as big, or as prolonged as Christmas. It is preceded by forty days of Lent, during which some Jamaicans abstain from their favourite indulgences. Many give up drinking alcohol, eating pork, or meat altogether. As a result, more fish tends to be eaten during Lent, particularly on Good Friday which is a fast day for the more religious. Here's an easy Easter bun recipe. Jamaica celebrates Independence on August 6 each year, in commemoration of its first Independence Day on August 6, 1962. The period leading up to the public holiday is crammed with parties and activities celebrating the island's culture. These Jamaican celebrations have become even more marked since the reintroduction in 1997 of another public holiday on August 1, Emancipation Day. This holiday recognises the day slaves were given full freedom in 1838. Many of the celebrations at Independence are spearheaded by government agencies. The grandeur of those activities is therefore dependent on how able and willing the government is to spend. The Jamaica Cultural Development Commission (JCDC) stages a variety of events comprising the performing, visual, literary and culinary arts. The Best of Festival series, Mello-Go-Round, The Festival Queen Competition and the Festival Song Competition are some of these events. A Grand Gala featuring hundreds of performers from across Jamaica, is held at the National Stadium in Kingston on Independence Day. There are sometimes float parades, especially in Kingston. The list of National Honours which will be handed out on Heroes Day in October, is published on Independence Day. At the parish level there are Emancipation Vigils starting the evening before August 1. These usually involve traditional Jamaican cooking and performances of traditional music and dance, ushering in the 'First of August'. On Independence Day an official flag raising ceremony is held in each parish. Denbigh Agricultural Show takes place at Denbigh in Clarendon at Independence time, usually on a weekend close to one of the two holidays. Jamaica's fourteen parishes showcase their produce, livestock, horticulture and agro-industries in an event which has traditionally been enjoyed by Jamaicans and visitors of all ages over the years. At the community level, street dances and festivities at homes and hang out spots are frequent. Many Jamaicans return from abroad to visit home during the summer time, making it perfect party and meet-old-friends time. 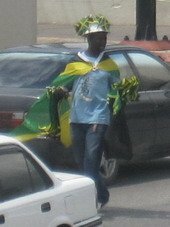 Jamaica and Jamaicans continue to face many trials, so when it's time to celebrate, we go all out!